NOTE: Each netting installation is different and some of the guidelines may not apply to your application. If you have questions or need help, please Contact Nixalite. The type of bird netting you will be installing. If you are not sure, review the Net Planning Guide for recommendations or go to the K-Net, B-Net or PollyNet pages. What kind of netting hardware you will be using. If not, review the Net Planning Guide or the Netting Hardware pages. If installing the netting with a tensioned cable system, the cables should be installed and ready to receive the netting. If not, review the Install Cable Hardware page. If installing the netting with Poly Hardware, you must know how each piece of hardware is installed. 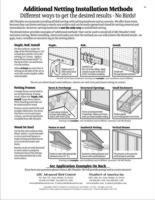 Review the steps outlined on the Install Poly Hardware page first. PollyNet, K-Net and B-Net bird netting can be cut to the desired size and shape with a good pair of scissors- no special cutting tools are needed. Nixalite offers the ST Scissors which are EMT shears. They are multipurpose and can be purchased with the Bird Netting Tools and Accessories. For PollyNet: Overlap the netting pieces a minimum of 6". Install the poly hardware seam fasteners every 6" on both sides of the seam for its full length. Twist Locks, Net Ties or Poly Cord are recommended for sealing PollyNet seams. DO NOT use metal net rings to seal PollyNet seams. K-Net HT: An overlap seam (also called a ‘freestanding’ seam) is where you need to join two pieces of K-Net bird netting together without the benefit of a support cable or part of the structure. 1. Overlap the edges of the two pieces of K-Net by at least 3 mesh (2.25 in./5.7cm). 2. Joining K-Net together at a seam is done with 'net rings'. Choose the rings and ring tool* that best suits your application. 3. 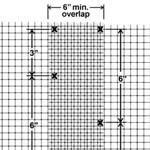 Join the two pieces of netting by installing one net ring in EACH overlapped 3/4" square mesh along the full length of the seam. * Nixalite offers 3 types of net rings and ring tools. For PollyNet: Roll the edges of the netting 2 or 3 times when installing PollyNet with PolyClips. 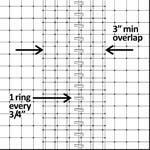 For K-Net & B-Net: Use Net Rings to fasten the K-Net to the perimeter cables. PolyClips can be used with the cables if desired. Support Cables: Used when there is minimal overhead support. Bird netting should NOT be allowed to run more than 50 feet without support cables. We recommend installing support cables every 25 feet. For K-Net use Net Rings to fasten the netting to the cable. For PollyNet, use the Net Ties. Objects hang lower than the installed netting: DO NOT cut large pieces out of the netting. To fit the netting around objects (such as lights), make simple slits or X cuts just big enough to fit the object. If the obstruction is close to an outside edge, make a straight cut from the edge to the obstruction. If it's in the middle of the installation area, cut a slit or X in the net below the object. Pass the object through the mesh and seal the netting back together above/behind it. Use seam hardware to seal up the slit or cuts around the object. Common construction materials can be used to install bird netting. This type of installation is constructed and customized to fit on-site. For a detailed page on these alternate methods of installation, load the Additional Netting Installation Methods page. There are many different ways to install bird netting but the goals of the installation should always be the same: no gaps, openings, wrinkles or excessive net sag. For more information on other installation methods Contact Nixalite.